Firstly let me say that I don’t think an infographic CV can replace your traditional CV, however in a marketplace full of competition whatever your background or role your seeking anything that gives you an edge is worth considering. To give myself that extra edge in my job seeking I decided to create an infographic CV and it went down really well with recruiters and the employer I ended up working with really rated it. For those of you not familiar with the term Infographics, they are graphic design tools for showing facts, figures and information in a much more visually pleasing and easy to digest format that is proving to be very popular, esepcially on the internet. If you haven’t seen any go to google or pinterest right now and type in infographics and you’ll see that they can be about almost anything, as long as there is some data and a story that the data can tell the viewer. I must mention that I’m lucky enough to live with an exceptional graphic designer, Ben Chapman, who has helped me to pull together the infographic CV below. If you are interested in having your own infographic CV you can email Ben at: info@benchapmandesign.co.uk to discuss your requirements. My infographic CV gives extra insight into my background, experience and skills that my traditional CV format does not and gives an at a glance guide to the type of person I am and the work roles I’m suitable for. The great thing about infographics is how they can take a lot of seemingly boring data like the number of years experience I have in different sectors and visually show them in a way that is more meaningful than a paragraph of words or bullet points. The fact that I have more years experience in Finance and IT than other sectors comes out if you read the whole of my traditional CV, but with the infographic CV you can see it explicitly with just one glance. I think of it as an additional marketing tool, not a replacement for my CV. I still upload my word doc version to the recruitment sites. Where I use my infographic CV is on all social media such as flickr and Facebook and it’s on my Linkedin profile and my website blog. I send it out in speculative emails to companies and recruiters. I also take it along to interviews. Wherever a recruitment website has the option to upload picture files I put my infographic cv there too. The important thing is to work out what you want your infographic CV to display, what’s the story you want it to tell? Knowing you want one and knowing what you want to put in it and what you want it to say about you are very different things! I did a lot of research before preparing the data for mine; I looked at good and bad examples on the net, thought about why I felt they were good or bad and how I could follow the best practice and avoid the bad. I thought for a long time about the type of information that my traditional CV struggled to get across succinctly or explicitly and the type of additional information that I felt that recruiters would find interesting and useful to know about me. After all, if it isn’t going to enhance my CV and recruitment prospects then it wasn’t going to be worth the effort. I ended up with loads of potential ideas for the content and then used a logical thought process to prioritise the information to select the items that made the cut. One of the biggest examples of bad practice was where people tried to cram too much into their infographics and where they didn’t tell a story. Finally I worked closely with the designer to make sure that the end result still ‘felt’ like me. For instance the swirls are very much a part of my Wealie Enterprises and Wealie Arts branding and something that speaks of my creativity and the about me words are my own vision of my personality. Just like a traditional CV it is important that you feel this is something that is a true representation of who you are. 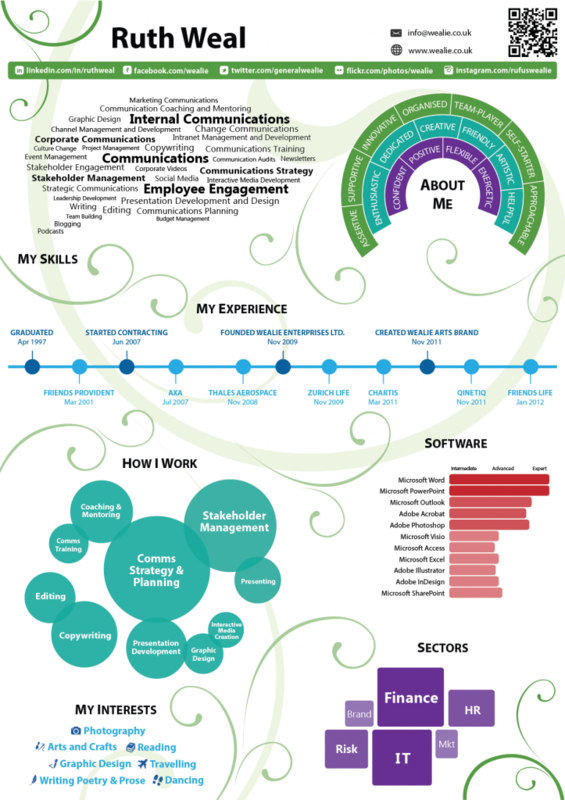 In conclusion I enjoyed the process of creating the inforgraphic CV it also helped me in my thinking to make some enhancements and changes to my standard CV as well. I must stress though that I don’t advocate replacing your traditional CV with an infographic. It’s better to think of it as an additional marketing tool, not a replacement for your CV. When job seeking I still upload my word document version to the recruitment sites and always send the word document out to recruiters and companies, but now I also attach my infographic CV as well. Where I really make my infographic CV work for me is on all social media such as flickr and Facebook and it’s on my Linkedin profile and my website blog. I also take it along to interviews and wherever a recruitment website has the option to upload picture files I put my infographic CVthere too. This entry was posted in Comms Tools, My Work, Wealie Advice and tagged advice, Curriculum Vitae, CV, cv advice, cv tips, CV Writing, cv writing tips, infographics, job hunting, job seeking, job seeking advice, job seeking tips, recruitment, recruitment advice, ruth weal, wealie. Bookmark the permalink. Really liked this, think it’s ground breaking and fresh. I hope this produces a great new role for you! It’s lifted my spirits after a recruitment meeting today which was all about the screening out questions, and defensive assessment criteria required for a maternity cover role – I felt sad that quite a fun, enterprising role should be forced into a faceless, bureaucratic shape. Great idea, I wonder if it would work alongside a traditional CV somehow. You have gotme thinking now. Thanks. I can confirm that it has been useful, but more at an interview stage and way of demonstrating my creative skills in actions as well as giving a bit of extra dimension about me that the interviewer wouldn’t have seen on my traditional CV. I have been sending it out as an addendumn if you like to my CV and have received really favourable feedback on it.